A lot of foodies scorn microwaves. They proudly announce that they don’t, and never would, have one in their kitchen and I can’t help but wonder if they imagine all those who have one subsist on microwave ready meals and reheated takeaways. I always feel a little sorry for them, honestly; their conviction that real foodies never microwave means they miss out on one of the great modern tools of the domestic kitchen. I’ve also heard of people using a microwave to speed proof yeasted doughs, to roast a head of garlic and to par cook jacket potatoes before finishing them in the oven. The latter we now cook in the slow cooker, and I’m yet to try the first two; let me know if you have! It won’t surprise you to learn that I’ve always had a microwave. My parents had one through most of my childhood, they kindly bought me a small, cheap one for my student house when I was at uni, and Pete and I have had one in our kitchen for the last two decades. Last year, I reviewed a couple of appliances designed by Heston for Sage, including my lovely Smartscoop ice cream machine (review post here). 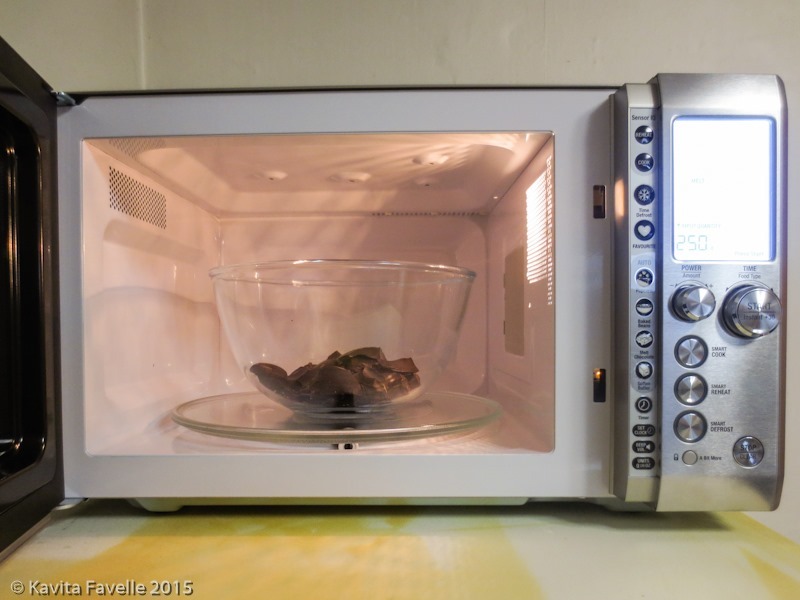 This month I’ve been putting my Heston for Sage Quick Touch microwave to the test. Because the water content in different foods varies so wildly, it can be tricky to guestimate how long different foods need in the microwave; chocolate contains only 3% water whereas most vegetables contain 95%!. Sensors in the Quick Touch microwave sense the amount of humidity released from food and automatically adjust the power level and the cooking time accordingly. There is a shortcut panel (of pre-sets) for common tasks such as melting chocolate, softening butter and heating baked beans (a personal favourite of Heston’s, apparently) – all you need to do is input the weight and touch the relevant button. 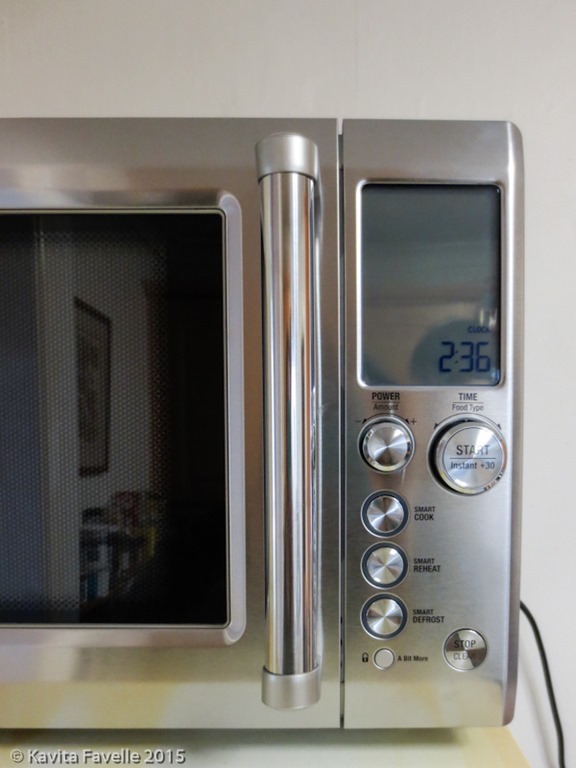 Of course, the Quick Touch has normal microwave functions as well – you can manually input your power (with 10 levels from 10% to 100%) and the amount of time. The maximum power is 1100 watts so it’s pretty versatile. 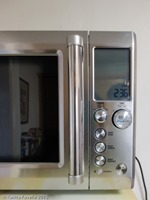 (Older consumer microwaves often topped out at 800 watts). Pete’s a big fan of the fact that the timer defaults to 30 seconds and if you don’t press any other button or enter a time, will simply start at full power as soon as you close the door. There’s also a cute A Bit More button when something is nearly done but not quite. So far, we’ve been very impressed with the melting butter, melting chocolate and sensor cook functions – perfectly cooked carrots and broccoli courtesy of the latter. Reheating leftovers works fine, as do all the other regular tasks I listed above. Heating seems to be even throughout a plate of food, rather than spots of scalding hot and still cold. It’s a heavy beast, so best for kitchens where it won’t need to be moved regularly. The price tag (around £250-270 depending on retailer) is high, especially as this microwave doesn’t have convection cooking or grilling functionality. By the way, if you caught a glimpse of the green writing on the front of the freezer in one of the images above, you may be interested in my post on how to organise the contents of a large freezer. I’ve also been talking to other food bloggers and writers about how they use their microwaves. Celia Brooks, cook and cookery book author, loves her microwave. She reminds us that “it’s not an oven but a tool to vibrate water molecules” and is therefore “especially good for veggies” with their high water content. As Celia’s main food group is vegetables, it’s an essential tool in her kitchen. She loves to steam vegetables in it, and she cooks aubergine chunks or slices with a little salt before adding them to a ratatouille or moussaka – they absorb less oil if cooked a little first. She likes to “fill flat mushroom caps with cream cheese and herbs”; cooking these in the microwave forms “a luscious sauce”. She also warms milk, makes porridge and heats single portions of dishes like lasagne, for which heating the regular oven would be wasteful. Helen Best-Shaw, food blogger and recipe developer, mainly uses hers for reheating, defrosting and cooking vegetables and grains. She says she nearly always cooks brown rice in it, which is “perfectly cooked in 14 minutes”. She also partially cooks baked potatoes before finishing in the oven. Urvashi Roe, food blogger and baker, uses her most days, mainly for defrosting and reheating. She also uses it to melt chocolate, and for “emergency baking” when she has chocolate cake cravings. She finds it particularly useful on days she’s running late, needs to feed the children and can simply take a batch-cooked soup or dhal out of the freezer, defrost, heat and serve. 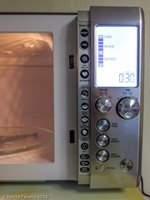 MiMi Aye, food blogger and cookery book author, loves the convenience of her microwave. She uses it to heat leftovers, cook vegetables like courgettes, warm soup and baked beans, cook ready meals and make microwave popcorn. Like Urvashi, she likes batch cooking meals and freezing them in portions. She reminds me that the microwave is also the easiest way to sterilise baby bottles. And she sent me this rather mesmerising video of blowing up Peeps (American marshmallow birds) in the microwave! Alicia Fourie, food blogger and keen cook, uses her microwave for warming milk and reheating leftovers. She also loves it for cooking asparagus and corn on the cob, finding it “much easier than boiling” and less faff than lighting the barbecue. Miss South, food blogger and cookery book author, originally got a microwave because, although she’s a “freezer fiend”, she lacks the organisation to take things out in time to defrost. She also loves using it to cut down on cooking times, pointing out that “microwaving takes less time and costs less than turning [her] electric cooker”. These days, she also uses the microwave to back up her slow cooker, by “batch cooking 3-4 portions of something lovely” and freezing the rest; being able to defrost and blast these home made ready meals in the microwave stops her “tiring of staples” and is also a boon when she’s ill or really busy. She is also a fan of microwaveable rice, which she pimps into fried rice with the addition of frozen peas and an egg. Of course, a microwave isn’t a substitute for other cooking appliances. I love my gas stove top and electric oven and I regularly use my slow cooker, sous vide cooker and power blender (which can cook soups and custards). 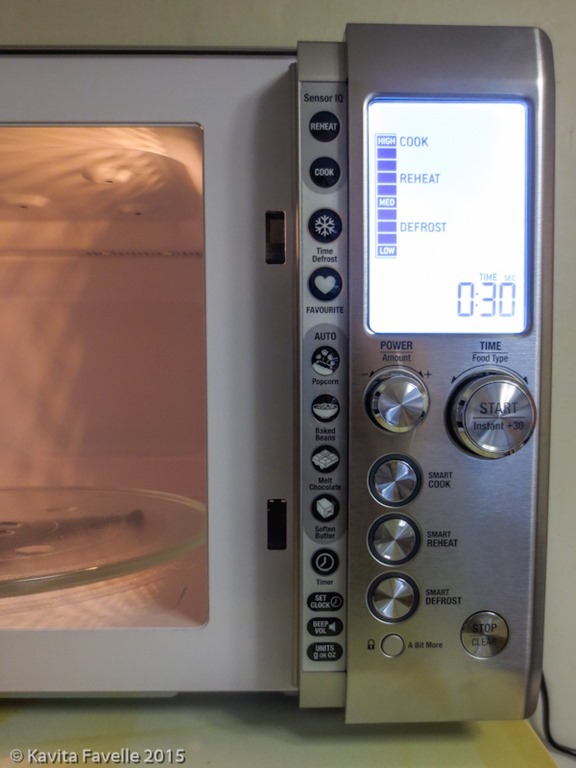 The key is to understand a microwave’s strengths and put it to use accordingly. Do you have a microwave? How do you use it? And what’s the one thing you use it for that you’d hate to do without? Kavey Eats received a Quick Touch microwave for review. Lakeland links are affiliate links, please see sidebar for more information. 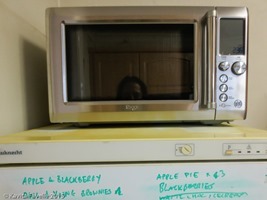 79 Comments to "Microwave Magic | Why I Love My Microwave"
I wouldn’t be without mine. Part cooking baked potatoes so you can have a jacket spud on a work night. Vegetables; it steams broccoli perfectly for me. Heating plates for Ma in law who insists her dinner has to be on hot plates. Made a Christmas pud in one at Christmas! Defrosting the meals I’ve stashed in the freezer. Heating cold press coffee the next day for my morning latte. When a friend was pregnant, she cooked mince in it as the smell of it cooking on the hob made her heave. Yes to all of those, except the potatoes which we now do in slow cooker and adore the texture that way. And yes on warming plates. I’ve still to try the cold pressed coffee technique, which I must as I’m not keen on bitterness and I understand less of that is extracted into a cold brew than a hot one. I do a very, very simple cold press. Cafetiere, coffee, cold water. Leave overnight, then depress the plunger in the morning! It is rather nice, I admit. More gentle flavour. Thanks for the mention. I must admit I think microwaves get a bad rep. If used in moderation it’s fine in my humble opinion. I don’t think I could cook every meal in it but I like the fact this one you have reviewed has so many functions. It’s very clever. Thanks for contributing, Urvashi. Agree, I think they get a bad rep too — they are just one more tool in a kitchen and a bloody useful tool too. It’s a shame to dismiss them out of some misplaced sense of what it is to be a true food lover! Living with a tiny kitchen, I haven’t got the counter top space for a microwave, and so I have a way around most of the things I used to use a microwave for – including heating portions off lasagne (in a pan over low heat with a little water and the lid on). That said the thing I really miss is being able to cook popadoms without oil in the microwave – just not the same under the grill. Yes, I can totally understand the issue of limited space — in which case you have to be more imaginative about making use of the selected appliances that you have — but it’s the set of people who scorn microwaves that I find fascinating! Kavey, that is the most interesting microwave recipe I have seen. I’m not a big fan of microwave cooking, I even left one behind in London because I did not use it but this is great!! 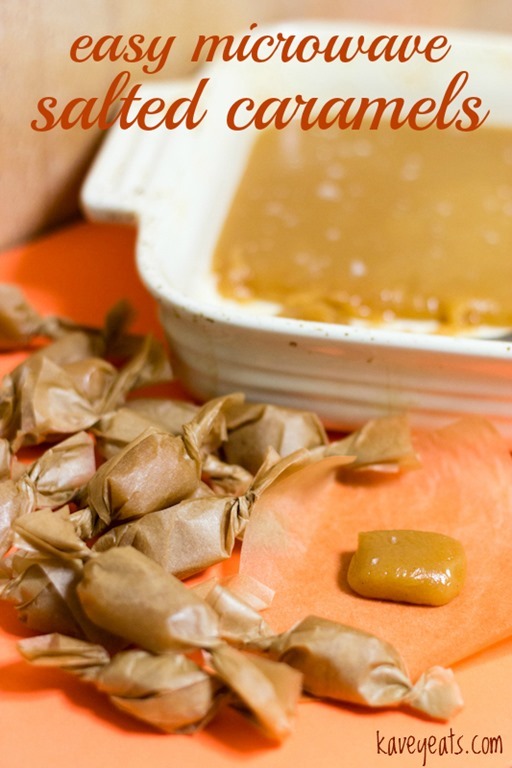 My girls would love to make some salted caramels… thanks for sharing. I can’t claim credit for the idea – microwave caramel/ toffee recipes abound on Pinterest — I looked at several recipes and will share the one we eventually came up with soon! I love my microwave and would replace it if it broke. I mainly use it for reheating leftovers, but it is much better than waiting for the oven to heat up. Definitely, and often better results as when something is cooked perfectly first time around, reheating in an oven often dries it out, I find. Yes to exactly what Rosi said, right down to the poppadoms! To fit one in I’d have to get rid of my slow cooker and deep fat fryer, or the Kitchenaid, and that’s not happening ever. With a much bigger kitchen I’d have a small one, no snobbery involved at all. I’ve never cooked poppadoms in a microwave, though now I come to think of it, I don’t think I’ve ever done them at home at all! Completely understand making compromises based on space limitations, and I wouldn’t suggest a microwave should be top of everyone’s list. I definitely know people who wouldn’t get one if they had a huge kitchen and unlimited budget, because they’re anti microwaves! I would not be without a microwave. I have put mine on a shelf in my walk-in pantry, which means it does not take up precious worktop space. When a recipe required me to soften onions without browning, I put them in a micro-proof dish and cook in the mw, either with or without butter. Perfection every time, and no stirring. I would never make scrambled eggs other than in the mw, as there is no messy pan to scrape clean. That’s a great idea for softening onions without browning – another tip I’d not thought of, thanks Helen! I like mine for peas, butter, chocolate, reheating and popadoms but wouldn’t be bothered if I didn’t have it. It’s handy more than essential, I’d say. I think we use it for more than that in our house, so for us I consider it a high priority. Not essential, but definitely one of the top 10 appliances, if not top 5. I’m in the Jacket Potato camp here, although if I am somewhere with a log fire then my favourite way to finish them is by popping them in the embers and leaving them to get ash-covered and lovely before lifting them out an hour or two of conversation later, when they look like meteorites, then scooping out the soft potato flesh and eating it with a spoon. The perfect balance of modern(ish) and stone age! So, in summary, I’m in favour of microwaves. I wouldn’t cry if it broke but it is handy. Haa, that’s wonderful imagery! We’ve switched to the slow cooker method for jackets but your way is indeed a great blend of modern and stone age! Wouldn’t be without it.its used for defrosting meat and meals that I’ve frozen .cooking peas and sweetcorn etc.melting butter .par cooking potatoes for the oven.I also cook my chicken drumsticks in it before finishing off on the bbq. I cook porridge and packet custard in it.so quick. Oh I forgot defrosting, didn’t I? That ought to have been in my bullet list! Yes, another handy use as we have a huge freezer and the microwave helps is make most use of it. I’ve gone all a bit microwave mad today. I made meringue! https://vine.co/v/OtPmBaI5hEE ok so it’s not quite as nice as the slow oven version but there is someone magical about watching it puff up and be ready in 1 1/2 minutes. Perfect for instant Eton mess! I’ve never come across this idea so am utterly intrigued by it. Must try, thank you so much for sharing. I haven’t had a microwave for 9 years…mainly because of space issues. Now we’re in the market for a combi microwave! I think a combi microwave makes a lot of sense, I like the idea of being able to use it to finish/ brown things and on the occasional days where I wish I had 2 conventional ovens, it would be a real boon. I’ve got a small cottage kitchen at home so any gadgetry really has to earn its footprint, I moved my microwave into the office at work and now use the space for an airfry. I miss it occasionally for defrosting but otherwise not really. Lots more use is made of the airfry. I feel that microwave ovens suffer from a ‘ready meal stigma’. Whether this is deserved or not is another matter, but I wouldn’t be without mine. I use it for totally different purposes than my normal hob or oven. Completely agree, very different uses. Someone just mentioned (on twitter) that the microwave makes crap toast. I was gobsmacked that anyone would think to even try toast in a microwave. It’s like trying to iron clothes with a kettle and then throwing away the kettle as being a useless appliance! Incidentally, we got rid of our toaster many years ago — decided a one-use appliance that took up so much space didn’t make sense, we just use the grill within the oven now and haven’t found it a hardship. I have quite mixed feelings about the microwave – it’s brilliant for melting chocolate and butter (subject to odd explosive behaviour) and good for reheating and occasional emergency defrosting. I’ve also been known to make baked potatoes (or sweet potatoes) in it on occasion, when I’ve not been organised enough to get them in the oven in time. Having said that – all these things can be done in other ways and the microwave takes up a not insignificant amount of counter space. I wonder fairly often about whether it might be better to get rid of it, but I suspect that we’ll probably keep it till it dies and then maybe rethink! I don’t have one but that’s pretty much down to not having a huge amount of space in my kitchen. We used to have one but it got damaged when we moved house. If I put a microwave in it, I wouldn’t have space to do things like roll out pastry or I’d have to sacrifice an appliance that I would use a lot more regularly (toaster, KitchenAid, coffee machine). I missed it at Christmas when cooking the Christmas pudding – we just bought a dinky one from Sainsburys and the cooking instructions were something like a couple of minutes in the microwave or over half an hour to steam! Definitely would look into getting one when we move next year if the kitchen is bigger. The Heston microwave looks pretty nifty to be honest, your caramels look ace too! Thank you Hannah! We got rid of our toaster some years ago, it took up to much space for a single use appliance. We just use our grill to toast now. I used to have a microwave but I didn’t use it much. It was VERY handy for melting butter and chocolate, and heating milk for coffee, but other than that we didn’t use it and it took up too much counter space so we got rid of it. It sounds like there are a lot more uses than we realised! Kate, we are still discovering new uses decades in! I love my microwave too for all the reasons listed above! That new microwave from Sage sounds amazing! It’s a great model. I’d love it to be combi as well, but the microwave aspect of it is excellent. I hear you – some people think microwaves are some sort of culinary evil incarnate – or they assume that if you have one you cook in it exclusively. Whatevs. I remember my mom having a microwave cookbook (back when they were a novelty in the 1980s) and there was a recipe for hard sugar coated fruit that was dead easy and pretty much foolproof. We tossed the book into the charity box years ago but now I wish I still had it… Anyhoo – I totally agree with your list of stuff that microwaves are useful for and I *love* the caramels! Thanks, Jeanne. Yes, I’ve seen comments that people prefer to cook from scratch — as if those of us who have a microwave don’t. We cook from scratch a fair bit. Although we also use ready made elements (oven chips, sausages, chicken kievs, lasagne) from time to time, those are all oven-cooked not microwave. The microwave is much more of a tool, as I said, melting butter for a cake batter that will, as most cakes do, cook in the oven. Steaming vegetables to be served with a gorgeous stew cooked on the stove top or in a slow cooker or in the oven. The caramel recipe is coming soon! Gen, yes, i do same with cake and brownies. Good reminder. Love popty ping! Sounds Welsh. I love our microwave – especially for reheating. It means I can make double batches of evening meals and on nights where I really don’t feel like cooking, we can have a homemade hot meal in minutes. Fab. Oh and for melting chocolate it’s a lot quicker and easier than using the bowl over a pan method. Without microwaves, there would be no microwave chips. Which isn’t necessarily a bad thing…. Still not quite soft enough.. I do have a microwave but very rarely use it. I need to make friends with it clearly – steaming veg is a good call. Yes definitely worth expanding what you use it for, steamed very so so easy! I use the one at work to reheat the free Waitrose coffee which I get in my lunchbreak and then drink at 4pm when its too busy to leave the newsroom. There. The secret is out. It’s also great to cook corn on the cob with no faffing about – also frozen peas, cooked in 20 seconds, and a very brief 10 seconds to gently warm a scone or Welsh Cake. Yes frozen peas perfect in microwave! And the odd forgotten coffee! I use mine to reheat leftovers and drinks, defrost things occasionally and, to make the best creamy scrambled eggs. That’s all but it’s in constant use so pretty indispensable! What I wouldn’t dream of doing is making rice in a microwave – draw the line at that! … I forgot to mention microwave popcorn. I bloody love that stuff. I stand alone in not being much into it! I don’t think I could live without my microwave! I don’t use my microwave to cook from scratch, but I do use it to reheat (and defrost occasionally) meals I’ve prepared in advance. The microwave is the only way to reheat small portions of food without wastage (I’m thinking back to when I weaned my son and to ice-cube portions of veg purée or dhals). It’s also great for heating tins of beans and Heinz tomato soup — saves on washing-up as you put the contents straight into a bowl — no saucepan needed. Good for warming a scone, making a cup of hot chocolate, and I love watching microwave popcorn do its magic. Same here, Huong, it’s all the many defrosting and heating tasks rather than cooking from scratch. We don’t have one, there just isn’t room for one in our tiny kitchen. I’m honestly not sure that we’d use one for anything other than thawing things out, and that usually just requires me to be a bit more organised and get things out of the freezer in advance. For jacket potatoes, I usually boil them, skins and all, for a bit before putting them in the oven, in order to speed up the cooking time. Mim, I think when space is tight it totally makes sense to priorotise. It’s not that I think everyone should have one but that i have when dismiss them as not an appliance foodies should have! Oh bet that was gorgeous. I was very late to the microwave game. When I got one, maybe 15 years ago, I told a friend “I finally got with the 90s and got a microwave.” She said “You mean the 70s!” I love it for melting butter, heating real maple syrup for pancakes and waffles, reheating certain leftovers that don’t do as well in the oven or stovetop. Yeah we visited a museum exhibit in Washington DC about the history of food and the microwave was earlier than realises! 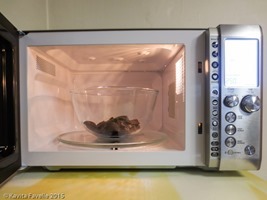 We needed a real foodie to write a spirited defence of the poor maligned microwave! Well done! In the past I’ve made cake, and heated Christmas puds in the microwave. They’re a great gadget and work fast – what’s not to like? I’d love to know about how long you heat the lemons & limes for squeezing. I also really want to know about your slow cooker potatoes. Please share your secrets, dear Kavey! My gosh, how could I forgot my wheat heat packs? I love those and the microwave is key there! I’m going to edit my post and add these in, as I use them so much! I don’t have a microwave though I do sometimes think having one might be useful for defrosting and reheating. In our first rented home the kitchen was so tiny that there was no space for a microwave and after 4+ years we got used to not having one even though I used to rely on it for reheating when in student accommodation. Since moving to a place with a slightly bigger kitchen we probably could fit one in but just haven’t got round to it as I’m just so used to being without one. Some great tips on using a mircowave there. I really only use mine for defrosting but really should explore some different recipes. Defrosting is very handy, for when you don’t forward plan to take something out of the freezer earlier. Lots more to use it for too though! 1st February: Read this post and found ourselves nodding lots – our uses of our (third) microwave mirror your list (a big nod to decrystallising honey! ), with poppadoms, porridge, defrosting, melting apricot jam for glazing cakes, heating sugar & maple syrups in an effort to preserve them longer and heating pads for our elderly cat’s bed added to the mix. Inherited cast offs or bought and from mechanical ‘ding’ to digital; the humble box seems to have assumed the status of useful tool in our battery of kitchen stuff. Maybe not as a principal means of cooking or used every day but useful nonetheless. 2nd February: Then, the test. Breakfast time. M.NL went into the kitchen and found that our microwave had died overnight. When he shared the news, we realised quickly that we’d rather taken it for granted. Replace? Oh yes! Number 4 (a combi, this time) is already in place. Oh gosh, so sorry the last one gave up the ghost but happy to hear it’s already been replaced! Hi Kavey, I have to admit at having two MW’s and there are only 2 of us !!! They both get used…. Fish is great cooked in it, especially if you have to take it off the bone, Sponge puds are a sinch and as someone else said, sweetcorn, done in one of those MW bags from Lakeland. A single cup of boiling water for an instant coffee. I used to have a cat who hated fridge cold tinned cat food, if I forgot to take it out of the fridge in time, a quick zap in the MW brought it up to room temp. Popadoms as well, not greasy and no messy pans to clean. Two! Why two? Good idea on fish, must do that more. And yes I’ve used it for sponge pudds, also been playing about with mug cakes for quick fix, but still need to tweak. Our kettle lets us do small volumes of water so tend to use that, just put only as much water as we need. Two because, the house we moved to had a built in one and the one we brought with us was 2nd hand and only a tenner, so having enough space for two, did not find it a problem. I did fully intend to sell it but never got around to it. So still have (and use) two. Also, with a cat ‘burglar’ the MW is a safe place to keep food thawing out !!! Looks like you use it in lots of ways too. Agree that small batches work well — we are only ever reheating a one-person plate of food, or steaming veggies for two people, or defrosting/ heating/ melting reasonably small amounts at a time. Great article and good to hear some positive comments about microwave cookers. We have been using them for 10 years teaching cooking skills in disadvantaged communities, to all ages. They are a brilliant time saving, convenient and nutrient saving way of cooking ecconomically. As a non-profit social enterprise we have delivered over 1400 sessions using this versatile device and have helped over 40,000 people make better use of this much maligned kitchen tool. Have a look at ourwebsite over 120 recipes from 10 minute soups to curry’s, rissotto’s and cheese & leek bread pudding! Nice to know that we are not alone in appreciating this modern (?) kitchen marvel! That’s really good to hear! Great work on your part and thank you so much for taking the time to comment. I’ll certainly check out your recipe collection!